Biju Menon feels bogged down by expectations that his latest film carried, feels Paresh C Palicha. Biju Menon has been considered a lucky mascot by Malayalam filmmakers for the last few years. His presence in the posters guarantees at least minimum quotient of entertainment and audiences make a beeline to the theatres. Some directors have even tried to weave stories around the strong points in his personality, that is, humour and physique. The latest in the list is director Jose Thomas’ Swarna Kaduva, written by Babu Janardhanan. It tells the story of a manipulative man whose definition of success is making money. 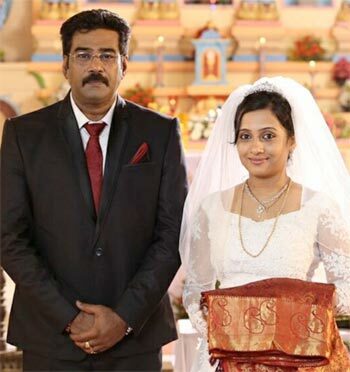 Rini (Biju Menon) works for a dubious gold merchant and a film producer Lolappan (Innocent). He does every dirty work for Lonappan (except scouting for females, by his own boastful admission but he won’t be averse of doing it, if the need arises). He always gives an inflated figure for the work accomplished by him and keeps a hefty share for himself. We enter their story when Lolappan hits a drunk Tamil labourer crossing the road in the middle of the night. Now, we see how important a cog Rini is in Lolappan’s wheel. The story moves forward as Rini goes to work clearing his boss from this case -- from dealing with the person selected to be presented to the police as the driver of the car and to convincing the family of the victim not to go for a police case. In the beginning, Lolappan is a nervous wreck because he was returning from Pollachi after having a rendezvous with an actress while he had told his wife that he was going to Ernakulam for a meeting. But he comes into his elements as things start falling in place and then it is a game of wits between the two of them. The film is written in Babu Janardhanan's signature style of flawed characters trying to outwit each other for their own betterment or survival, and dark or gloomy situations. Of course, every dialogue has a humorous punch because it is a Biju Menon film. Biju Menon feels bogged down by expectations that this film carried with a title similar to his own successful Vellimoonga (2014). And he is made to carry a role that is a cross between Vaasthavam (2006) and Pranchiyettan and the Saint (2010), which is a hard task for any actor. He is supported well by actors like Innocent and Hareesh Perumanna who is the new find of this season, for playing the silly sidekick for the leading men. The ladies like Iniya and Poojitha Menon get their moments to shine. Swarna Kaduva (Golden Tiger) proves that using birds or animal names does not ensure success with the audience. The earlier Biju Menon and team realises that the better.